Monday Mood Board - Pink Love! This week’s Monday Mood Board is inspired by Valentine’s Day and my favorite color of all time…PINK ! The inspiration started with this fabulous headboard from Posh Tots. I paired it up with some new goodies from my shop, my Peacock Pillow and my Hot Pink Chaz Pillows. I’ve also been experimenting with Poufs! I posted on my FB Page if anyone thought it was a good idea and judging from the response I had I believe I will pursue creating them! Of course I get all kinds of inspiration from Pinterest and this is where I found these great Vintage Lamps from ETSY. (Always trying to support those small businesses) The fantastic side table is from Shop Ten25. 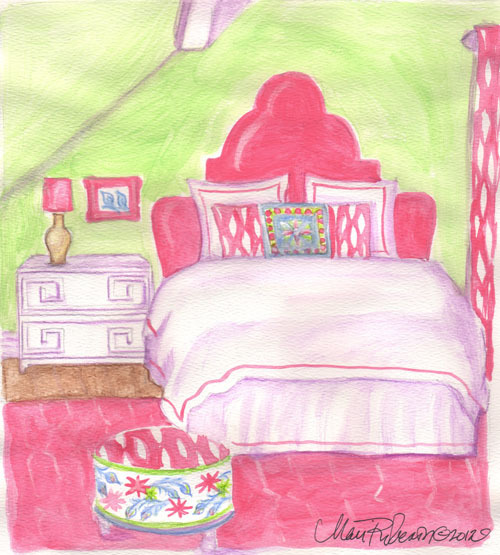 This watermelon rug is divine from Madeline Weinrib and what I really love is this frame from John Murphy. You must check out his photography in his shop. So fresh! You can always find my picks for my Mood Board Illustrations and where to get these items (plus a few more that didn’t make it to my final illustration) by following me on Pinterest.